Can you believe it's January, and 2016!?! Time really does fly doesn't it? Well with that being said, I have a confession to make. I'm not really a winter sort of girl. Nope. Give me sunshine and a hammock over the bitter cold any day. However, this year has found me feeling a little bit differently. This winter my soul seems to be longing for heaps of snow, fuzzy sweaters and warm comfort food to go with it. 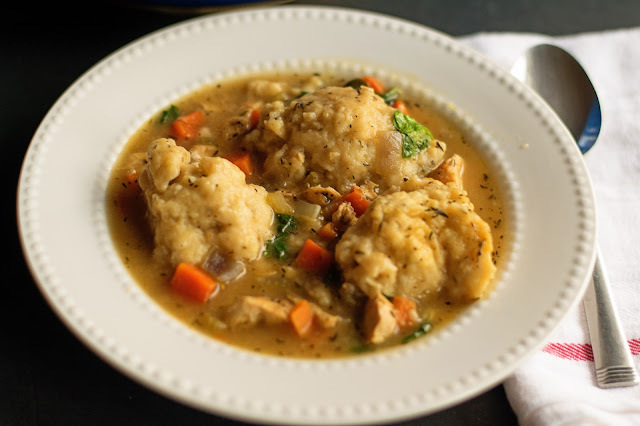 And while I can't control the snow, I CAN promise you that my Chicken and Drop Dumpling Recipe is just what the doctor ordered in the food department. To begin you will want to season your boneless skinless chicken breasts with salt and pepper on both sides. Then add the extra virgin olive oil to a Dutch Oven or heavy bottomed pot. Place it over medium/high heat and allow it to get hot. Add the chicken to the pot and brown for 4-6 minutes on each side. While the chicken is browning in the pot you can work on dicing your vegetables. Once the chicken has been browned on both sides remove it from the pot and add the vegetables. Cook for 3-4 minutes until the onions are soft and translucent and the other vegetables are tender. Next you will add the garlic to the pot. Cook until you can smell the garlic coming from the pan. Season the vegetables with a little salt and pepper. One thing you should always do is season at every layer of cooking. This way you get even flavor throughout the entire dish. Now add the dried thyme to the vegetables. Adding the dried spices to the pot now will help reconstitute the oils and give you maximum flavor. Now you can dice or shred the chicken. It it entirely up to you what you do. I personally prefer chunks of meat in mine, but there is no judgement here. Add the chicken back to the pot. Pour in the chicken stock and bring to a simmer. While the pot is simmering you can assemble the drop dumplings. Be sure to whisk everything together so that all of the ingredients are evenly dispersed through the dumplings. Heat in the microwave until the butter is melted and the milk is warm, about 30-45 seconds. Now while gently stirring with a rubber spatula slowly pour in the warm milk mixture. Keep stirring until a dough is formed. One you have finished the dough for the dumplings, return to the pot of simmer broth on the stove. Using a scoop like this one, or a spoon, drop tablespoon sized balls of dumpling dough into the simmering stock. It will look a little something like this. Cover the pot with the lid, but be sure to leave it slightly vented. Cook the dumplings for 10 minutes. I realize that this is not a traditional ingredient in Chicken and Drop Dumplings, but I like to add a little baby spinach in right at the end of cooking. It just needs enough time to wilt. 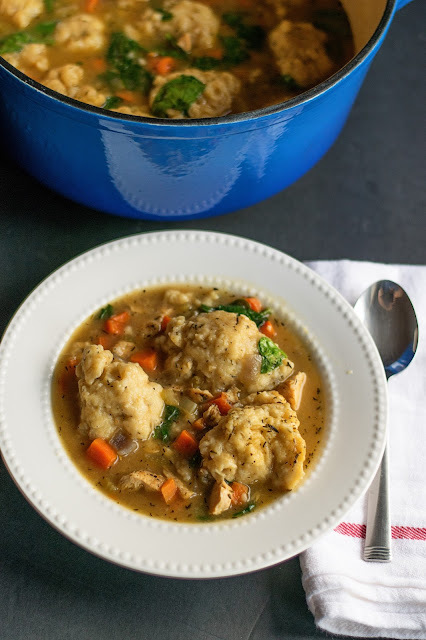 And there you have it, a stunning, warm, and hearty pot of Chicken and Drop Dumplings. And though it is a simple dish, this one is vibrant, full of color AND flavor. Mmmmm. Look and that savory chicken, tangy broth, tender vegetables, and little pillows of dumplings! I can't wait to just dive into this bowl. 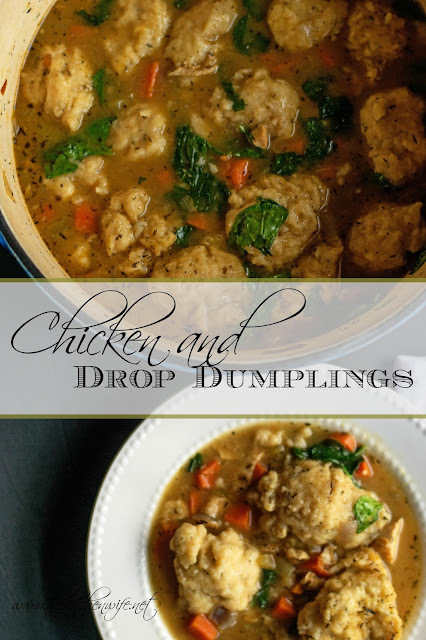 So, this winter when the cold weather starts setting in and you are feeling frigid in your soul, whip up this amazing recipe for Chicken and Drop Dumplings! You will be so glad you did. Now pardon me while I dig into this goodness! Season the chicken, on both sides, with salt and pepper. Add the oil to a heavy bottom pot and place it over medium/high heat. Let the pot get hot. Add the chicken to the pot and let the chicken cook for 4-6 minutes on each side until it is fully cooked and browned. Remove the chicken from the pot add the carrots, onions, celery to the pot. Cook until the vegetables are soft and tender, 3-4 minutes. Add the garlic to the pot. Cook until you smell the garlic from the pan. Either shred or dice the cooked chicken and return to the pot with the vegetables. Season with salt, pepper, and dried thyme. In a mixing bowl combine the flour, baking powder, seasoning salt, and pepper. Whisk together until all of the seasoning is well blended into the flour. In a separate bowl combine to warm milk and melted butter. While stirring with a rubber spatula, slowly pour the milk and butter into the flour mixture. Continue stirring until a dough is formed. 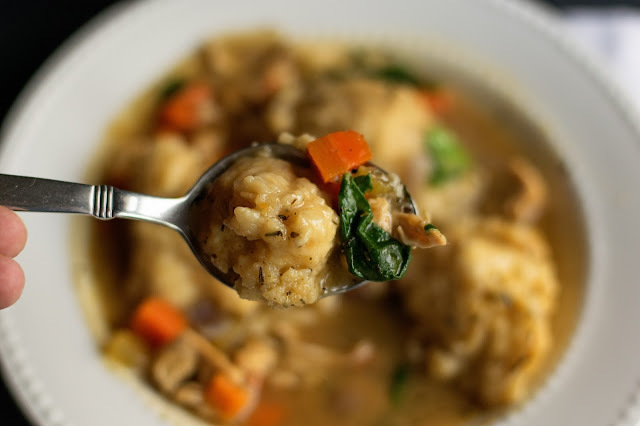 Using a scoop or a spoon drop tablespoon sized dumpling balls into the simmering broth. Cover the pot with the lid slightly vented and cook for 10 minutes. Add the spinach just before serving. This looks amazing, Mandee. As always. Gosh, your recipes keep looking more delicious. I can smell this one cooking from here! YUM! Awww thanks girl! You are too sweet!